By the time she had reached her mid-30s, Tana Amen had nearly given up on good health. Through a lifetime of chronic medical ailments, including severe digestive issues, recurrent infections and, most devastatingly, a battle with thyroid cancer, there was never a point when Tana felt consistently healthy. Doctors ascribed her poor health to genetics, bad luck, and a family history of obesity and heart disease. But even when Tana committed to a standard fitness and eating regimen, her health failed to improve.That’s when she realized that she needed to make a real change. She needed to figure out how to improve her health . . . for good. 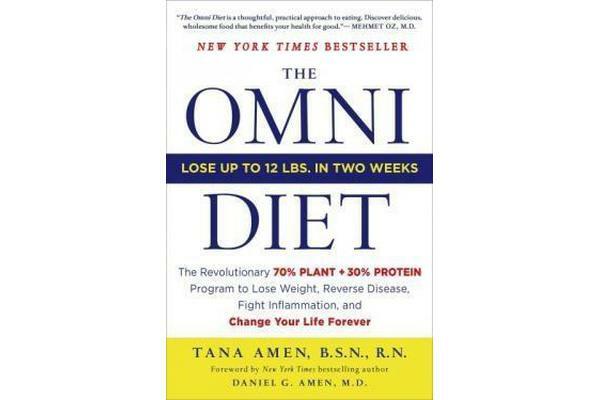 The Omni Diet is the culmination of a decade-long quest by Tana Amen to study the relationship between food and the body, and to understand how proper nutrition not only impacts weight loss, but actually holds the key to reversing chronic disease, decreasing inflammation, healing the body, and dramatically improving quality of life. So what is The Omni Diet? It’s an easy-to-follow plan based on a 70/30 plant-to-protein model. This is not a restrictive diet or another page in the high-protein vs. vegetarian diet wars, but a universal map to better health, one that Tana has distilled into a lean six-week program. It offers a simple plan that provides an abundance of illness-fighting nutrients from plant-based foods and high-quality protein to keep the brain sharp and muscles and organs functioning at peak condition. The balance of 70% plant-based foods and 30% protein restores energy, slashes risk of disease, optimizes brain and hormone functioning, produces dramatic weight loss, and promotes health from the inside out. With delicious and satisfying recipes, easy-to-follow exercises, and important advice and tips, you will see results – in your weight and overall health – immediately. Follow this revolutionary, paradigm-shifting plan and experience its life-changing results as you unleash the healing power of food.